From world-renowned cheeses and hand-pressed olive oils to lovingly-crafted chocolate truffles and boutique brew beer, it’s no surprise to discover that the artisan food scene is thriving. 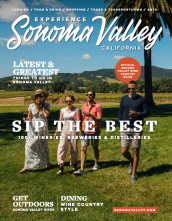 Whether it’s authentic foodie souvenirs, picnic supplies or epicurean tastings you’re looking for, farm-to-table highlights are in no short supply in Sonoma. Here are few not to miss. For experiential cheesemaking classes, The Epicurean Connection is a must-visit for foodies. Founded by award-winning cheesemaker, Sheana Davis - who&apos;s been at the heart of the farmstead cheese movement for more than 24 years - there’s no better place to start your epicurean tour of Sonoma. Handmade in Sonoma since 1931 - and sustainably-produced since 2003 - Vella Cheese Company continues the legacy of its world-class cheesemaking legacy in an award-winning range of gourmet cheeses. Visit its historic store Monday through Saturday to sample delicious cheddars, monterey jack, italian-style cheeses, and more. Located right on Sonoma Plaza, watch sweet creations being lovingly-made in front of you at Wine Country Chocolate’s viewable kitchen. Specializing in world-class, wine-infused chocolates and truffles, walk-in tastings makes this shop a great place to visit while exploring downtown Sonoma, while its daily-rotating flavors mean you may well find yourself back again for more. Another epicurean must-visit on Sonoma Plaza, family-run Figone’s is a small specialty Olive Oil and Balsamic producer, established in 1989. Offering complimentary daily tastings of its premium oils, beautiful olive wood products, and more, you may well find your perfect Sonoma souvenir here too. From award-winning oil tastings and unique pairings to culinary gift shopping and tours of its beautiful, Tuscan-inspired grounds, a visit to The Olive Press is a real treat for foodies. Starting out as the first olive mill in Sonoma, it’s now the most highly-award producer in the nation. Seek out its tasting room at the Jacuzzi Family Winery on Arnold Drive. With over 20 fresh beers on tap, the Sonoma Springs german beer hall-inspired taproom is pure bliss for ale-lovers, offering a charming setting in which to enjoy its range of award-winning brews. From hand-crafted california ales to german style beers to barrel aged brews, there’s something for every palate, whether it’s a pint, a tasting flight, or a growler to go. Open daily from 5am to 9.30pm, Sonoma Market is your one-stop-shop for picnic supplies - whatever the time of day. Order picnic boxes for pick-up ahead of time, or browse the deli offerings in store. From grass-fed meats and organic local produce to gourmet groceries and Sonoma Valley fine wines, you’re sure to tick off your whole shopping list here. Held every Tuesday evening from May through October, Sonoma Plaza&apos;s Valley of the Moon Farmers Market is the best place in town for diverse local produce, healthy food vendors, and community spirit.